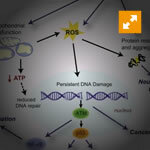 Oxidative stress describes the steady state level of oxidative damage in a cell, tissue, or organ, caused by the reactive oxygen species (ROS). This damage can have a widespread effect on an entire organism, or on just a single molecule. It is caused by an imbalance between the production of reactive oxygen and a biological system\'s ability to readily detoxify the reactive intermediates or easily repair the resulting damage. All forms of life maintain a reducing environment within their cells through a constant input of metabolic energy which is preserved by enzymes. Disturbances in this normal redox state can cause toxic effects through the production of cell damaging peroxides and free radicals. 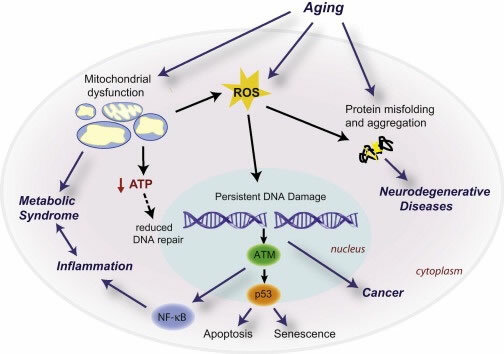 Research on human oxidative stress has led to links to many diseases such as atherosclerosis, Parkinson\'s disease and Alzheimer\'s disease and it may also be important in ageing. At the same time, reactive oxygen species can also be beneficial, as they are used by the immune system as a way to attack and kill pathogens.